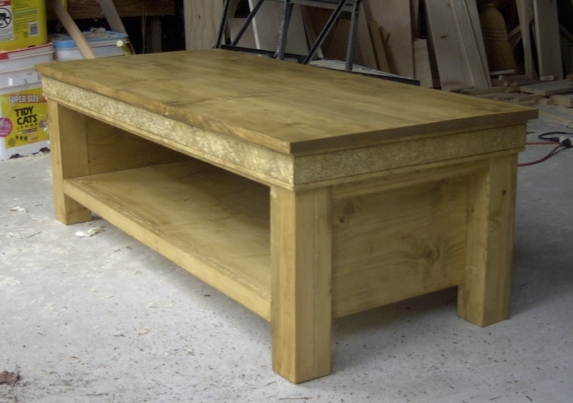 This is a good photo of the completed and stained coffee table. The legs and rose engraving underneath the top stand out very well now that they are stained and varnished. 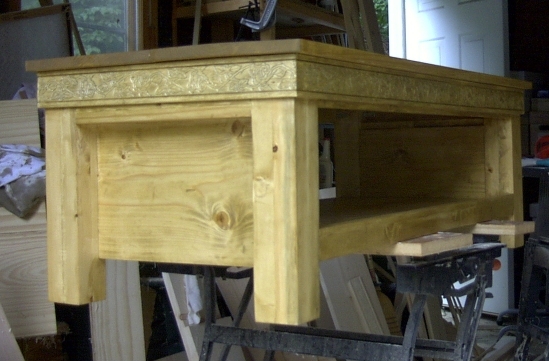 Once the table was completed, I then sanded it thoroughly and stained it using a Golden Oak colored stain. I treated the rose engraving a little differently, by wiping off the stain as I applied it so it would sink into the engraved portions the most to highlight it. Once the stain was on and dried, I sanded it again and put two coats of varnish on it, sanding between coats to give it a satin shine. In this photo you can see all four legs and the top, along with the supporting frame members. 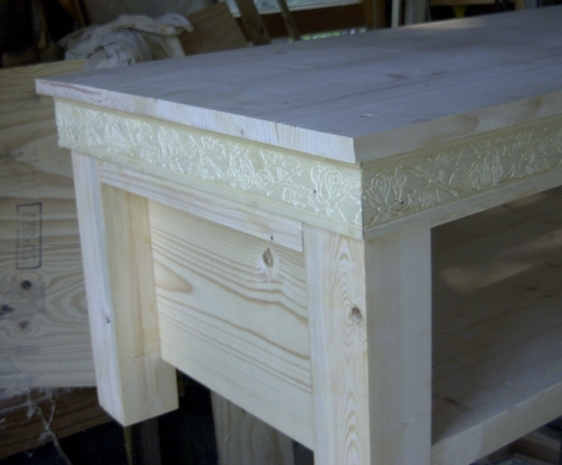 The top is made from two 1″x12″ boards edge glued together after I planed those surfaces smooth. The frame members are glued to the top as well but fastened to the legs using metal brackets to allow for expansion and contraction. 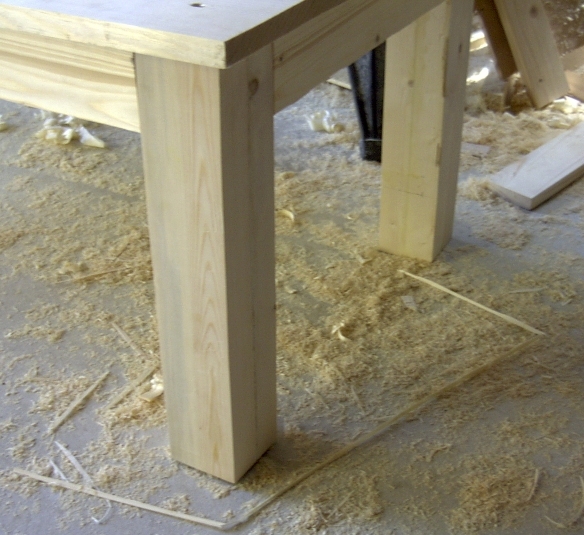 The legs of the table are made from four 2″x2″ pieces of wood, ripped off of standard 2×4’s and then rejoined together to form a 4″ square. I did this to get different grain patterns and colors on each leg. 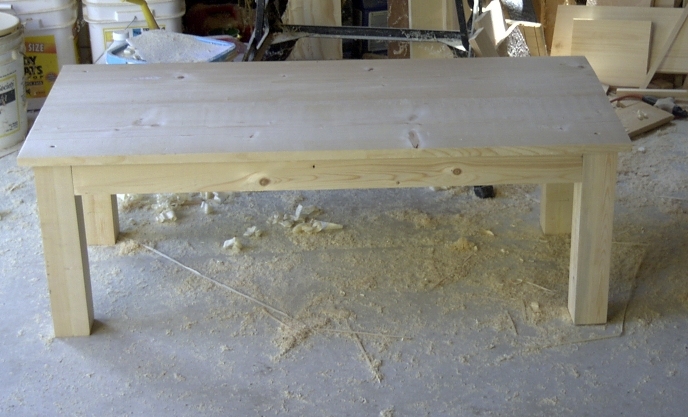 The legs are joined to the table top with metal brackets and wood screws; you can see one of the screw holes in the top above the leg in the photo. All the legs were planed smooth after the pieces were glued together.